Why use a Provider of Choice? What do Technical Committees do? Important Annoncement: The Western Australian government has announced that Fire Protection Association Australia (FPA Australia) is the first organisation to be recognised as an accrediting body for Bushfire Practitioners in accordance with the state's Bushfire Accreditation Framework released earlier this year. Click here to read more. Fire Protection Association Australia (FPA Australia) administers the Bushfire Planning and Design (BPAD) Accreditation Scheme (the Scheme). The Scheme was first developed and implemented in 2006 in response to demands from the community, government and industry to establish a recognition program for bushfire planning and design (BPAD) Accredited Practitioners to assist the community undertaking development on land subject to bushfire impact. The Scheme was designed for individuals (practitioners) delivering bushfire assessment, planning, design and advice services. 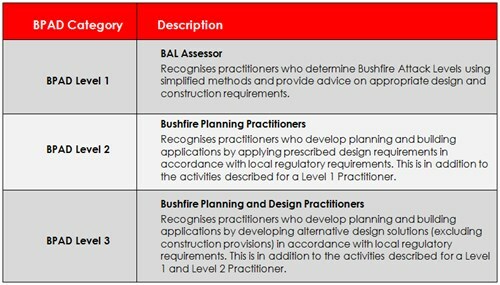 It accredits practitioners who meet criteria based on specific accreditation and competency requirements, including a detailed knowledge of and ability to practically apply the relevant planning, development and building legislation and policies, the Building Code of Australia and Australian Standard AS3959 Construction of buildings in bushfire prone areas. The Scheme provides an enhanced level of confidence for government and the community that practitioners providing bushfire planning and design services are accredited by a suitably robust scheme that complies with the State Government's accreditation framework and is administered by the national peak body for fire safety. BPAD Accredited Practitioners are recognised by industry, regulators, fire agencies, end-users and the community as providers of professional bushfire assessment, planning, design and advice services. * All companies appearing on this list employ/engage a BPAD Accredited Practitioner. However, the Company may not be a Corporate Member of FPA Australia. Only Corporate Members will appear in the "Find a BPAD Provider" search results. Accredited Practitioners must demonstrate they meet specific competency requirements. 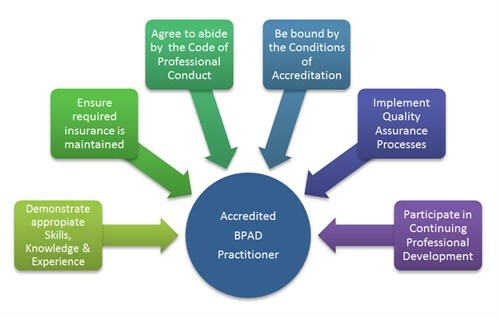 Accreditation is a formal acknowledgement by FPA Australia that an Accredited Practitioner has met the requirements of the BPAD Accreditation Scheme. In addition to meeting all of the competency requirements, applicants must ensure key requirements are also met as per diagram below. The BPAD Accreditation Scheme is underpinned by a national framework that includes three categories of accreditation as shown in the table below. In recognition of the professional skills and knowledge required to undertake BPAD services; practitioners applying for accreditation must demonstrate that their skills and knowledge are commensurate with the community's expectation of professionals who offer bushfire planning and design services. Applicants can choose from one of two pathways into the Scheme (Note: Not applicable in New South Wales). Qualified accreditation is available through attainment of tertiary level qualifications in an appropriate bushfire risk assessment and management course. Experienced (transitional) accreditation is only available for those seeking BPAD-Level 1 and BPAD-Level 2 accreditation and is a transitional accreditation with a 4 year transition period to ultimately gain Qualified Accreditation. There are specific requirements that must be met prior to making an application for either Experienced (transitional) accreditation or Qualified accreditation. These requirements are detailed in the handbook. Enquiries regarding BPAD should be directed to the Accreditation/Licensing department at the FPA Australia National Office on 03 8892 3131 or by email to bpad@fpaa.com.au . Disclaimer: The BPAD accreditation scheme is not a substitute for any requirements for licensing, registration or accreditation established by relevant applicable legislation (state, territory and/or federal) unless otherwise confirmed by relevant regulation. Please Note: Consultation regarding all elements of the Bushfire Planning and Design Scheme (BPAD) is ongoing, and as such all information contained on this page is subject to change. 12 April 2019 Read more..
02 April 2019 Read more..
28 February 2019 Read more..
11 February 2019 Read more..
07 February 2019 Read more..